Khalid Kidwai, after retiring end last year from his decade and half stewardship role in Pakistan’s nuclear weapons program as head of its Strategic Plans Division, presented a holistic picture of Pakistan’s nuclear direction at the Carnegie International Nuclear Policy Conference 2015. He candidly admitted that Nasr, Pakistan’s tactical nuclear missile system, was part of its ‘full spectrum’ nuclear capability buildup designed to deter conventional operations by India, along with a ‘healthy’ conventional capability balance. In his view, it was to stump Cold Start since to him nuclear weapons were an extention of conventional weapons and would be used to supplement conventional capability. He rationalized this by referring to its deterrence value in this was aimed at closing what was to India a gap below the nuclear threshold in which it could employ its conventional advantage. His emphasis on deterrent role of nuclear capability was probed by his interlocutor, Peter Lavoy, as to whether Pakistan would dissociate itself from militant groups since such linkages were destabilizing, as they prompted India to rely on its conventional forces. In answer, Kidwai seemed to justify the connection between the military and militants. This prelude brings out the linkage between Pakistan’s strategic doctrine and its military doctrines – subconventional, conventional and nuclear - as also brings to fore the interaction between the doctrines – strategic and military - of the two states, India and Pakistan. Clearly then, any examination of these doctrines cannot be done in isolation but instead has to be done collectively and in their interaction with the doctrine of the other side. This paper attempts to make such an examination. It first looks at Pakistani doctrine and the Indian perspective of the doctrines. It then looks at Indian doctrines and their inter-dependence with Pakistani doctrines. It finally tries to work out the opportunities that exist for doctrinal exchanges between the two states for strategic stability, conflict management and conflict resolution. Unlike in most states in which strategic doctrine is a governmental prerogative, Pakistan’s strategic doctrine is one made by its military. The military aims to create the conditions for resolution of the Kashmir question, which to it is one of self-determination. With military deterrence in place, politicians are to get on with resolving the issue with India. Deterrence is therefore the declaratory strategic doctrine. The manner this is worked is by nuclear deterrence covering both nuclear and conventional levels. Nuclear weapons are to make up for the conventional asymmetry with India, even if a conventional balance, though not parity, is sought to be maintained. With deterrence in place at the conventional-nuclear level, at the subconventional level, proxy war through militants is to incentivize Indian interest in resolution of the Kashmir question. Strategic doctrine is therefore not merely one of deterrence as Pakistan presents it, but of offensive deterrence, with Pakistan being offensive at the subconventional level through use of proxies and at the nuclear level by a tacit ‘first use’ doctrine. At the nuclear level, ‘full spectrum’ capability implies having second strike capability not in the traditional invulnerable sense of a ‘boomer’, but through other measures such as vertical proliferation, dispersion, secrecy, using diesel electric submarines etc. It also has nuclear weapons and delivery systems enabling operational level and a ‘shoot and scoot … quick response’ tactical level nuclear weapons capability. Not adhering to No First Use and intending to deploy its nuclear capability in conflict, it has different options of nuclear first use. This facilitates graduated escalation, thereby incentivizing avoidance of value targeting for India. A conflict going nuclear in this manner can, with minimum damage possible, be expected to focus international attention on its earliest termination. The post conflict phase would then inevitably include pressure for resolution of the ‘root causes’ that include Kashmir. The nuclear doctrine is easily placed in the offensive category. It does not adhere to NFU; it deploys tactical level nuclear weapons and is a warfighting nuclear doctrine. In addition, the extension of ballistic missile ranges to about 3000m with the Shaheen III is intended to cover all of India’s landmass and its island territories, including the Andaman and Nicobar Islands where Pakistan apprehends a prospective location for long range ballistic missiles and strategic submarines. Khalid Kidwai justifies this as an attempt to degrade India’s second strike capability. At the conventional level, the doctrine is not an offensive one. The conventional equation with India has changed over the past two decades with India having the edge of one strike corps over Pakistan. It can be argued that Pakistan’s was an offensive doctrine half a century ago, but no longer. In the 1965 War, it launched Operation Grand Slam and also the thrust by 1 Armoured Division into Khem Karan. However, in the 1971 War it was largely defensive and did not strike in the west in order to save its East, even though it could have done so in the west. In the seventies and eighties, it was credited with an offensive conventional doctrine and intent to make quick gains relying on interior lines of communication and proximity to the border of its military bases. However, conventional asymmetry under circumstance of US aid cut off in the nineties and a raging proxy war in Kashmir made resort to offensive respectively difficult and unnecessary. Pakistan’s conventional doctrine can therefore be seen to be one of defensive deterrence in that it maintains a capability to be able to blunt India’s conventional offensives, while attempting through strategic posturing to make quick gains of its own. At the subconventional level its historical proxy war penchant easily enables characterizing of its doctrine as an offensive doctrine. While it has for tactical reasons owing to the situation to its west restrained itself over the last decade, it has the capability to up the ante. This continues to exist due to the population in Kashmir continuing to be alienated from India to an extent. It has the capability to up the proxy war ante in India with mega terror attacks, witnessed twice over last decade. However, its alleged attempt at expanding proxy war possibilities in the Indian hinterland have not been met with any success, allegations of minority perpetrated terrorism in India being highly exaggerated. India’s subconventional response measures continuing in place and its counter infiltration posture strengthened by the LC fence have influenced Pakistan strategy (as distinct from doctrine). India has indicated no desire to settle outstanding differences Pakistan’s way and it has instead, in Pakistan’s view, subject Pakistan to a reverse proxy war. Pakistan’s subconventional doctrine has consequently shifted in its focus – temporarily – towards Afghanistan, launch pad of India’s alleged proxy war against Pakistan; but remains offensive. Even its subconventional level responses are offensive; witness Pakistan army’s tackling of terror in its west. India’s strategic doctrine, though unwritten, can be seen to be moving from defensive deterrence to offensive deterrence and in relation to Pakistan is arguably one of compellence. India, though pledged to a bilateral and peaceful settlement to the Kashmir dispute, is unable to countenance politically the implications for sovereignty over the Valley. It has therefore had to deter Pakistan from militarily changing the status quo. However, rising power asymmetry in India’s favour and its ambitions have led to India wanting to transcend the region. It is therefore moving from offensive deterrence to compellence, visible in the deepening conventional military asymmetry, intelligence-led reversal of proxy war at the subconventional level and a variegated nuclear capability enabling both first strike potential, if it’s BMD and spy satellite capabilities are taken seriously, and an invulnerable second strike capability by decade end. Pakistan, seeing the writing on the wall and going downhill, is expected to fall into line. This bespeaks of compellence and is reflected in its military doctrines. Whereas its conventional capability based on counter offensive capability enabled defensive deterrence, it was unable to extend conventional deterrence to the subconventional level. The nuclear factor had intervened with Pakistan checkmating India’s conventional capability and gaining thereby impunity at the subconventional level. India’s has been a defensive subconventional level response thus far aimed at containing the proxy war. It appears to have covertly launched its proxy war in Baluchistan as early as last decade. Pakistan’s complaint found mention in the Sharm es Shaikh joint statement and has more unambiguously been repeated half decade down the line with the Pakistan army leveling a direct accusation this year. The shift to the offensive is readily visible at the conventional level. The Cold Start doctrine was advertised as ‘proactive strategy’. The capability has been created within the pivot corps for offensive operations with integrated battle groups. Strike corps continue to practice in exercises multiple obstacle crossings along multiple axes. The shift from defensive deterrence to offensive was to end Pakistani impunity at the subcoventional level. Pakistan’s nuclear cover is given short shrift with one chief saying that they are not for warfighting but are ‘a strategic capability and that is where it should end.’ There is a decided nonchalance in India’s reception of Nasr. The answer to it is taken to be at the nuclear level even as offensive conventional operations envisage even strike corps operations. In one report, a strategic command (as distinct from strategic forces command) is to be operationalised, perhaps based on Central Command, for coordinating deep battles of strike corps on enemy territory. Counter intuitively the nuclear doctrine is offensive. The NFU in the doctrine is taken as reflecting defensive deterrence. However, since NFU is merely a declaration of intent and that the doctrine envisages ‘massive’ retaliation for inflicting punitive levels of nuclear damage make it less defensive than it is advertised. Taken in relation to the conventional doctrine it is decidedly more offensive than India would admit to. As seen, the conventional doctrine is an offensive one. In light of Pakistani projections of a low nuclear threshold, there is need to pull up the nuclear threshold so as to create the necessary gap for conventional operations below the threshold. This is attempted by promising a massive counter strike, presumably counter value to any form of nuclear use against India or its troops anywhere, including on enemy territory. Therefore, the declaratory nuclear doctrine in conjunction with the offensive conventional doctrine is offensive. Together they reflect and express a strategic doctrine of compellence. Additionally, since both the subconventional doctrine of 2006 and conventional doctrine of 2004 were revised without mention in the open domain even by way of a press release in 2010 and 2013 respectively, there is no guarantee that the declaratory nuclear doctrine of 2003 continues as India’s nuclear doctrine. The logic of ‘massive’ nuclear retaliation does not stand strategic scrutiny in the more likely circumstance of nuclear first use by Pakistan of lower order nuclear first use. The findings on the global climate effects of even a regional nuclear war since the doctrine was adopted in 2003 suggest that it is unimplementable (to use Admiral Bhagwat’s phrase). Therefore, it is well nigh likely that India may have an operational doctrine distinct from its declaratory doctrine. In effect, India may be contemplating a quid pro quo and quid pro quo plus response, for which it has the capability. There is apparently a doctrinal contest on between the two states. At the subconventional level, India has turned the tables on Pakistan, if Pakistan’s protestations of being on the receiving end of India’s intelligence operations are taken at face value. At the conventional level, India’s proactive doctrine has led to Pakistan reviewing its conventional counter in the exercise series Azm e Nau and going in for tactical nuclear weapons. The latter was to plug the gap between the subconventional and nuclear levels that India wanted to use for its conventional operations. At the nuclear level, both doctrines at a declaratory level continue as offensive doctrines. India questions Pakistan’s resolve for lower order first use by continuing with its conventional exercises involving strike corps such the one this year that tested the integrated battle groups (IBG) of a pivot corps in South Western Command and a strike corps of Western Command. The exercise area being the same in general area Suratgarh and the dates in late April suggests that the two exercised together with the pivot corps providing the launch pads for the strike corps in the area captured by its IBGs. This implies the strike corps, not needing to get involved in the break in battles, would be able with its complement of forces to strike deeper. This is to challenge Pakistan’s resolve to follow through on its deterrent promise of nuclear first use. Alongside, it can be imagined that the two other strike corps would also be in action and so would an assortment of pivot corps IBGs, such as Gurj Division that also practiced its paces this year. In turn, Pakistan questions India’s threat to ‘call its bluff’ and its follow through with ‘massive’ nuclear retaliation. Pakistan’s coverage through Shaheen III of possible sites of strategic assets as far away as the Andaman and Nicobar islands is to degrade the ability and intent of ‘massive’ retaliation, thereby discouraging it. The interactivity between the two doctrines is evident. India’s ‘massive’ nuclear retaliation postulation has led to damage limitation thinking in Pakistan in its acquiring ballistic missiles of the appropriate range. The aim is perhaps to encourage a shift towards proportionate response on India’s part, thereby reducing any damage that may accrue on account of its nuclear first use. The unconsidered fallout of Pakistan’s action - advertised by no less than Khalid Kidwai as intended to deny India a second strike capability - is to make ‘massive’ nuclear retaliation appear more promising to India under the logic of ‘use them, lose them’. More importantly, Kidwai’s reasoning betrays a gap in his cognizance of nuclear theory. He says that this is to ‘deny’ India a second strike capability, little realizing that this is inherently destabilizing since it would provoke India to go in instead for the ‘massive’ counter strike or indeed attempt a first strike of its own regardless at the crunch of its NFU pledge. In fact, mutually deterrence is based on mutually assured destruction ability on both sides. If one side attempts to deny the other side such an ability, it would impose pressure on the side so denied for being, to quote General Patton, ‘firstest with the mostest’ or be consider first strike (as distinct from first use). Likewise, there is a flaw in India’s nuclear doctrine in its use of term ‘massive’ in first place. Since, as seen, such levels of attack on a nuclear power with nuclear weapons in three digits is not feasible, India by not undertaking a review of its declaratory doctrine even after a decade of its promulgation in 2003, is compounding the earlier error of inclusion of the term. If indeed it has reviewed its doctrine and has a different operational doctrine, then this lack of transparency on India’s part is leading to vertical proliferation on Pakistan’s part. The interlocking of the doctrines of the two sides at all three levels – subconventional, conventional and nuclear – is not conducive to security for either state or the region. With Pakistan indicating that it is feeling the pinch from India’s intelligence operations, it has three options. One is to revive the Kashmiri insurgency, a problematic proposition in light of India’s control. Second, it could escalate the proxy war in Afghanistan in order to set the conditions for reverting its attention to its east. Third, it could resort to mega terror attacks, but runs the risk of India’s conventional counter. This counter need not necessarily be in the Cold Start mode, but may be infliction of harm by conventional forces to include air attacks and possible limited forays by an IBG or two with lightening retraction. The prospects of escalation in this last scenario lend pause. Since Pakistan may not be able to respond in the air medium, being army dominated it may attempt do so on land. This could be in the Kashmir theatre so as to create a gap in the fence briefly for influx of terrorists to revive the insurgency. Its precautionary moves elsewhere could trigger the Cold Start timeline. Since Pakistan would be able to cope with IBGs by themselves, India may want to supplement with strike corps to come out on top of the engagement. Pakistan seeing this as a test of its resolve – India’s attempt at calling its bluff – it may be inclined from a future deterrence point of view to exhibit its tactical nuclear weapons. With the introduction of nuclear weapons on the battlefield, India may find itself in a commitment trap. Escalation can ensue, particularly if Pakistan also preemptively employs its Shaheen III. This may push India towards ‘massive’ nuclear retaliation, where it could otherwise have settled for proportionate retaliation under the ‘flexible’ nuclear retaliatory logic. Since nuclear confidence building measures have not proceeded to the required extent, de-escalation and exchange termination would be dependent on diplomatic resources of the international community. Clearly, there is a case for a doctrinal exchange between India and Pakistan. Both have exhibited deficiencies in their understanding of nuclear doctrine with Khalid Kidwai not appreciating the criticality of second strike ability for stability and India promising unnecessarily a ‘massive’ nuclear retaliation and unable to step back from the commitment trap it is in even a decade since the gaffe. Pakistan’s projection of South Asia as a nuclear hotspot in its intent to go nuclear and India’s show of nonchalance in contemplating first use by its adversary do not build confidence that the two states are as responsible as they appear to themselves. India cannot wait for its neighbor’s initiative. Pakistan is military ruled. It has less to lose. It is living in the past. India is the major power in the region. Its economic trajectory can certainly withstand limited war and may even stand to benefit by it, but even a limited nuclear war may be a little too much. India therefore must reconcile its strategic doctrine with its grand strategy. An economy-centric grand strategy is not in sync with a strategic doctrine of compellence. The strategic doctrine requires being tweaked to revert to deterrence, albeit offensive deterrence. This must then reflect in the military doctrines: nuclear, conventional and subconventional. The National Security Council has its task cut out. 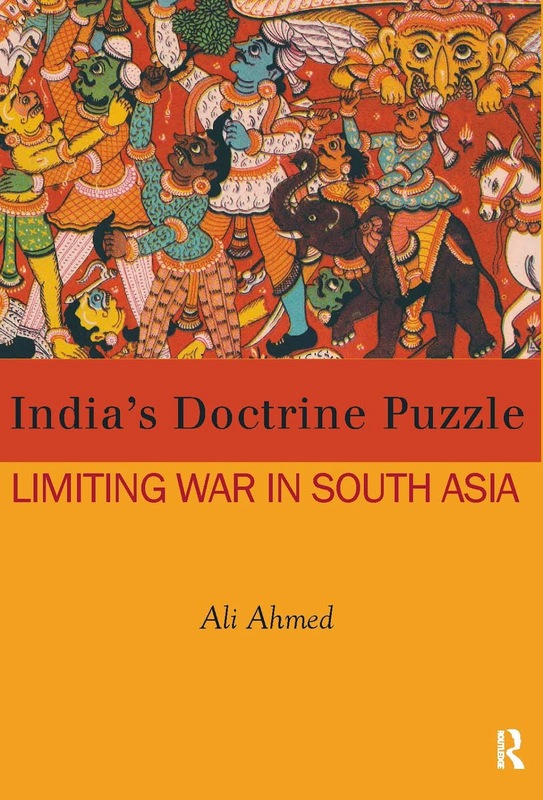 Ali Ahmed is author of India’s Doctrine Puzzle: Limiting War in South Asia (Routledge 2014), On War in South Asia and On Peace in South Asia (both CinnamonTeal 2015). He blogs at www.ali-writings.blogspot.in. ‘A Conversation with Gen. Khalid Kidwai’, Monitor 360, Carnegie International Nuclear Policy Conference 2015 March 23, 2015, available at http://carnegieendowment.org/files/03-230315carnegieKIDWAI.pdf, accessed on 16 May 2015.
http://fas.org/blogs/security/2012/01/warfighting/, accessed on 14 May 2015. Ali Ahmed, ‘Opening up the doctrinal space’, available at http://www.claws.in/1375/opening-up-the-doctrinal-space-ali-ahmed.html, accessed on 29 April 2015. 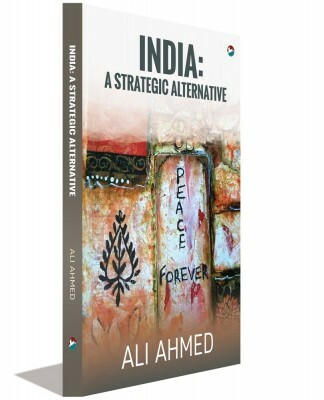 Ali Ahmed, ‘This Year’s Maneuver Season In India’, available at http://www.eurasiareview.com/11052015-this-years-maneuver-season-in-india-oped/, accessed on 12 May 2015. 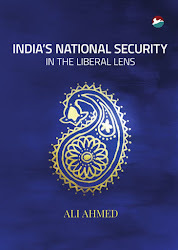 Ali Ahmed, ‘What This Year’s Maneuver Season in India Tells Us’, available at http://www.foreignpolicyjournal.com/2015/05/12/what-this-years-maneuver-season-in-india-tells-us/, accessed on 14 May 2015.